Remote patient monitoring (RPM) is to monitor patients outside of conventional clinical settings. There are two major advantages of RPM; it increases access to care and decreases healthcare delivery costs. It also allows patients to maintain independence, prevent complications and minimize personal problem arises. A key feature of RPM such as remote monitoring can be realized with Sollae System’s serial Ethernet/Wireless LAN device server. 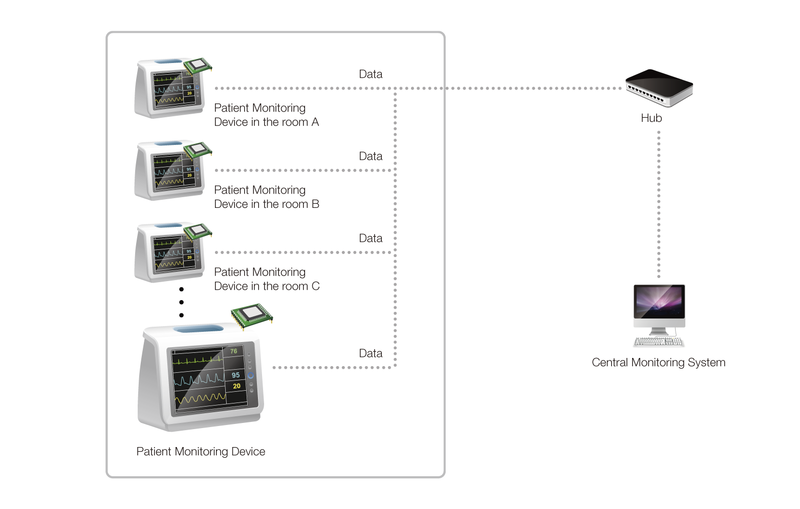 Sollae Systems’ serial Ethernet/Wireless LAN device server can be applied to a patient monitor to remotely monitor physiological signals of patients. Sollae Systems’ device server allows the patient monitor to be directly accessible from the central monitoring system via LAN or Wireless LAN, so that doctors and health care professionals can keep an eye on patients over the Internet. It also helps them stay informed of patients’ conditions to be fully prepared for emergencies.